Just Hot Tubs has gained a glowing television publicity boost for the promotion of its Beacon model that is part of a user-friendly stable of hot tub designs dedicated to dealers in the British market. The five-seater Beacon, pictured, is one of the latest options in the USA-manufactured Eco Range, which has been introduced to the flourishing Just Hot Tubs dealership network in response to increased demand from consumers requiring advanced functionality that is friendly to their bodies and the environment. It was featured on a recent episode of ‘This Morning’ and ‘Loose Women’ as part of an incredible £250,000 prize giveaway, which includes a Dream Lodge at Blossom Hill holiday park in Dunkeswell, Devon. During the live filming for the television shows the lure of the Beacon, which features 36 Versa-Flo jets and the unique family-friendly Nature² Mineral Sanitisation, was too much for ITV’s Alison Hammond who stepped into the hot tub fully clothed towards the end of the show. Viewers of the ‘Loose Women’ episode also saw Joe Swash jump into the Beacon and appear to lose his underwear, which he threw towards the cheering garden party. Other options in the Eco Range include the four-seater ‘Dartmoor’; and the ‘Exmoor’, which is a corner three-seater model; as well as the round five-seater ‘Snowdonia’; and the spacious six-seater ‘New Forest’. Coming in at 213 x 213 x 97cm, the New Forest model incorporates a lounge seat design and has quickly made a big impact in the market by shooting to the top of the Eco Range sales charts, which has resulted in it being bestowed with a 2017 WhatSpa? Best Buy Award accolade in the £5,000 to £7,499 price category. The latest edition of the consumer magazine that features a promotional campaign for the Just Hot Tubs range to help boost sales for its growing network of dealers. These include dedicated Just Hot Tubs dealership locations from multi award-winning Deep End Pools, which include Just Hot Tubs Plymouth, with a showroom in Cornwall, and Just Hot Tubs Reading; as well as Just Hot Tubs specialist dealership Lakeside Spas in Bristol. 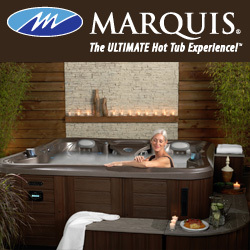 Filed Under: New products, News, News & views, Products, Sales & marketing Tagged With: hot tub dealers, Just Hot Tubs, WhatSpa?